The gable-fronted style of conservatory adds a sense of grandeur to any home providing a lightairy feel, giving it a distinctive appearance typical of this period spanning from 1760-1820. Featuring the same rectangular floor space as an Edwardian, a Gable offers excellent use of internal space. 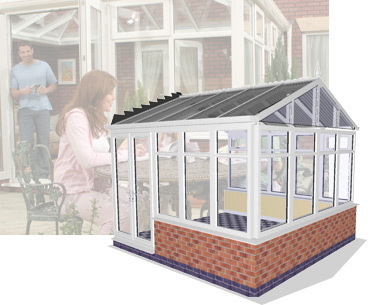 The front panel of the roof remains upright and creates a feeling of great height within the conservatory. This conservatory's gable roof construction maximises the available space and is a particularly useful alternative to a lean to conservatory roof where restricted depth does not allow the use of an Edwardian design. Gable roofs can be constructed with a variety of roof pitches, so they can be made to complement the gables on your house, extension, greenhouse, or even your shed. As with all Prior Conservatories self build structures, a gabled roof extension can serve the dual purpose of increasing your living space and bringing the colours of your garden inside, as it acts as a perfect garden room. For that extra special project, such as building a swimming pool enclosure, Prior Conservatories are able to supply portal frame conservatories, although this would be out of the range of the DIY enthusiast and would require the services of a skilled builder or specialist conservatory fitter. If you are looking for something a little different for your gable roof conservatory, we can provide you with a variety of frame designs for the gable end. Apart from the vertical bars shown here, we can also manufacture angled radial bars, or even a sunburst design. If you would like further details, or a price, please contact us by email at sales@priorconservatories.co.uk, by freephone on 0800 001 5848, or fax on 01789 720220.